IT WAS three and easy for Woking as three second-half strikes sealed a third win on the spin. Altrincham – back in the Conference Premier after a three-year absence – have belied their lowly 18th position in the standings in recent weeks, prior to hosting Woking, of course. The Robins posted one of the shock results of the season with a 3-1 away win at then second-place FC Halifax Town before holding out for a battling goalless draw at Grimsby Town in midweek. And all that after a sickness bug had swept through manager Lee Sinnott’s squad. The weekend saw Montserrat international Dean Morgan replace Keiran Murtagh at the point of a midfield diamond; with the latter Murtagh busy scoring for Antigua and Barbuda in warmer climates. Midfield compadre Josh Payne also flew out for international duty after this one for England C’s penultimate Challenge Trophy qualifier in Istanbul on Tuesday night. A sharp shower at kick-off made for some slick conditions early on, with busy Alty keeper Stuart Coburn spilling slippery strikes from Conference top-scorer Scott Rendell and the ever-versatile John Goddard from tight angles. Home boss Sinnott urged his players forward, and they duly obliged by forcing a handful of dangerous set-piece situations. 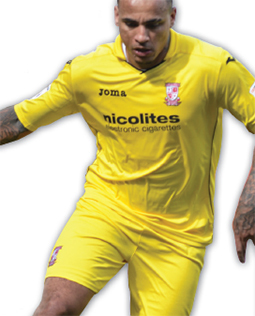 Returning Cards defender James Clarke was cautioned for taking out Damian Reeves before Nicky Clee and skipper Shaun Densmore chanced their arms from free-kicks on the edge of Ross Worner’s area. Sinnott’s leading scorers Reeves and James Lawrie have carried the goal scoring burden for goal-shy strugglers Altrincham – the pair plundering nine of their side’s 16 goals. But having gone goalless for five games, Reeves literally passed up his side’s best chance of the half as he opted to slide the buck to partner Lawrie when clean through. Lawrie scuffed his left footer wide of Worner’s gaping goal. Juggernaut junior Jack Marriott then crashed a rebound into the terraces, as a combination of a hopeful hand from Coburn and the woodwork conspired to send the sides in level at the break. But with Marriott’s strike partner Rendell in such a rich vein of form, it was only a matter of time before the firing forward bagged his 12th goal of a prolific season, and it duly followed five minutes into the second-half as he swept home Goddard’s low centre from the right. Just a third of the way through the current campaign, Rendell has already hit over half of his tally from last season. The odds of an away win were stacked even further in the Cards’ favour when Adam Griffin left the showery on-field conditions for an early bath before the hour mark – the home full-back mistiming a 50-50 with Theo Lewis. Morgan soon made the numerical advantage pay as he coolly finished off a smart one-two with Rendell, Morgan dinking a delightful early finish past Coburn before the overworked keeper had time to set himself. Hill sent on Kevin Betsy to test out his healing knee for the foregone conclusion of the final 20 minutes. Fans’ favourite Betsy almost finished off a free-flowing move between fellow subs Adam Newton and Giuseppe Sole, but was crowded out late on. Altrincham knew the game was up when they were forced to finish the game with nine men after sub Ryan Crowther limped off. 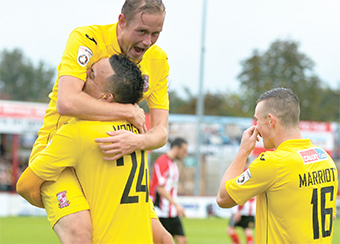 Again, Woking made the numbers work in their favour as captain for the day Payne lashed home a neat Sole lay-off to make it three in stoppage time. The win moves Woking up to second in the table, three points behind leaders Barnet but with a game in hand. WOKING: Worner, Jones, Clarke, Cestor, Arthur, Payne, Morgan (Betsy, 68mins), Lewis, Goddard (Newton, 68mins), Rendell, Marriott (Sole, 77mins). WOKING hosted a Stevenage XI in a specially arranged training game at Kingfield last Tuesday lunchtime to help recuperate four of Garry Hill’s first team squad. Goalkeeper Jake Cole, defender James Clarke and Woking legend Kevin Betsy all returned to complete the full 90 minutes of the 2-2 draw. Betsy, 36, had to undergo surgery in the summer to repair a meniscal ligament tear, but received a standing ovation as he returned three weeks ahead of schedule when he featured as a second-half substitute against Nuneaton two weeks ago. For Mark Ricketts it was a 30th birthday to forget, however, as the Cards skipper hobbled out of the Stevenage game with a recurrence of the calf knock which has kept him out of action for a month.